Morgan : American financier · One Book. One Author. One Hour. Notes on front endpapers, flysheet and back endpapers: Solitaire, Depression, Pujo Committee. Morgan partner--Dwight Morrow, Ann Morrow Lindbergh. J.P. Hypochondriacal all his life. What's an American Napoleon who thought they were one. p 420. William D'Alton Mann p 325. Town Topico-BlackMail--financier with mistresses. Edith Randolph, Adelaide Douglas, Annette Markoe. B. 1837 April 17, d. 1913 at 75 (3 days short of 76). Jack died at 75--1943 in Fla. p 233. What is Morganization? John P. Morgan II, Charles Morgan> where are they (p 757), what was relationship. Foundation support. Markoe Schiefflin. J.P's father taught him about G.W. by Sparks but he liked Napoleon. p 47. Mimi Sturges proposes marriage. 1861--She's sick often. Married Oct 7, 1861--Europe tour. Diagnosed TB--dies Feb 7, 1862. 1862-1865 Civil War. Did J.P.M. benefit from war? Draft dodgers p 109. 1864-Courts Fanny Tracey p 114, Louisa Mar 10 1866, Jack-Sept 7, 1867. 1871 J.P. wanted to retire merged with Tony Drexel p 561. You use Henry Adams as a thread. Morgan and Edison's electricity 1882-106 electric lamps fire. Andrew Carnegie--p 399. Homestead 1892. Pinkerton stockade--8000 troops. Over golf sold Carnegie Steel to Morgan for 480 million. List of U.S. Steel investors p 407 footnote. Robert Lincoln and others. Bought Raphael in Paris 1901. The will 34 pages--p 684/$80 million. Singular Woman p 509. Belle de Costa Greene. Richard Grenne--U.S. Grant's tome. Was she Morgan's mistress? Anne--organized colony club friends with Elsie de Wolfe-Elizabeth Marbury (Bessie) looked like Pierpont. The Bachelors Anne in love with her “Horrid to look at”--Belle. 1910-Dr. Ranisford--Morgan's closest male confidant suffers depression, breakdown and affair. Belle's letters--affair w Bernard Berenson p 657 engaged? Infuriates J.P. Adelaide Douglas--affair began 1895 (p 612), last trip to Europe 1908. Built a new house with back entrance. William and Dorothy Straight bank scandal. Herbert Croly's the New Rep.--Bill dies 1918. Kept Engine running 24 hrs a day waiting in Adirondacks. (How many) Corsair, Bar Harbor, Aix, Paris, Met Museum of Art 23 Wall Street, Newport -fishing Bt, Jekyl Island, Ga., Adirondack Mts., Cragston, 219 Madison, Adirondack--Camp Uncas, two English Houses, Egypt. 1890--25th Wedding Anniversary p 285 enter Edith Randolph--J.P. burns letter with his father--Junius--written twice a week. Lady Victoria Sackville--a romantic skirmish late in life his nose--several quotes p 293. Dr. Markoe-woman's hospital funded by Morgan took care of his depression--abortions and contraceptives. 1894--Annette Wetmore married James Markoe. The Trust-1890 law John Sherman. Senior Partners never called him J.P. Lam checks some of the book sections on the Contents pages. Panic of 1907--Morgan had functioned as county's central banker p 574. Was Morgan a national hero after Panic. 1908-Congress passes Currency Act, est. National Monetary Commission Nelson Aldrich headed it p 594. Library-near his home on Park--1906--1.2 mill. Charles McKim. Morgan-President of Metropolitan Museum of Art 1904. Panic of 1893--p 319 more roads defaulted than any time in history 192 lines operating 40,000 miles $2.5 Bil cap. Panic of 1873--1895 Christmas, Cleveland meets with Morgan--make a deal. Ochs buys New York Times--$25,000 loan from Morgan. William Jennings Bryan defeated by McKinley. P 160 Banking, Travel, Society, Episcopal Church, history, art, delicate health. Was Morgan an honest man. T. Roosevelt symbolic, move against Northern Securities. The Steicken photos p 650. J.P. tore up first proof. John Singer Sargeant turned him down. P 85 Memic (Amelia) Sturges, p 127 Fanny, Edith Sybill Randolph (284) widowed. Adelaide Townsend Douglass 496. Belle de Costa Greene p 510. Lady Victoria Sackville p 627. Anne, Juliet, Jack children. Notes/Underlinings reflect and add further details to concepts presented in the notes above. 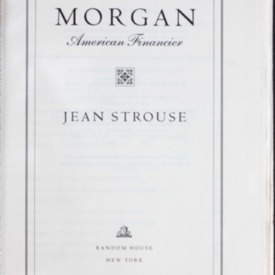 Strouse, Jean, “Morgan : American financier,” One Book. One Author. One Hour., accessed April 21, 2019, http://booknotes.gmu.edu/items/show/439. A century ago, J. Pierpont Morgan bestrode the financial world like a colossus. The organizing force behind General Electric, U.S. Steel, and vast railroad empires, he served for decades as America's unofficial central banker: a few months after he died in 1913, the Federal Reserve replaced the private system he had devised. An early supporter of Thomas Edison and Andrew Carnegie, the confidant (and rival) of Theodore Roosevelt, England's Edward VII, and Germany's Kaiser Wilhelm, and the companion of several fascinating women, Morgan shaped his world and ours in countless ways. Yet since his death he has remained a mysterious figure, celebrated as a hero of industrial progress and vilified as a rapacious robber baron.In this account, drawn from more than a decade's work in newly available archives, biographer Jean Strouse animates Morgan's life and times to reveal the entirely human character behind the often terrifying visage.Morgan brings eye-opening perspectives to the role the banker played in the emerging U.S. economy as he raised capital in Europe, reorganized bankrupt railroads, stabilized markets in times of crisis, and set up many of the corporate and financial structures we take for granted. And surprising new stories introduce us in vivid detail to Morgan's childhood in Hartford and Boston, his schooling in Switzerland and Germany, the start of his career in New York - as well as to his relations with his esteemed and exacting father, with his adored first and difficult second wives, with his children, partners, business associates, female consorts, and friends.Morgan had a second major career as a collector of art, stocking America with visual and literary treasures of the past. Strouse's biography gives dramatic new dimension not only to Morgan but to the culture, political struggles, and social conflicts of America's momentous Gilded Age. "Morgan, J. Pierpont (John Pierpont), 1837-1913."